Hawaii Island is the biggest of all the Hawaiian Islands, so there’s more to do and more ground to cover. Don’t be overwhelmed though. Here are some tips when it comes to putting together an awesome Big Island vacation. The first thing that comes to mind when thinking of Hawaii is most likely the beach and, when it comes to beaches, many of the Big Islands’ are carved from lava rock that juts into the ocean. 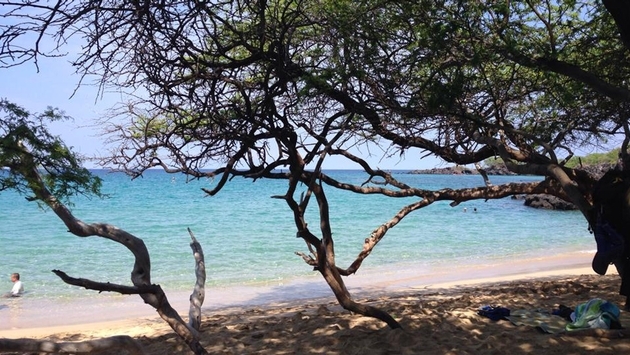 To experience this type of exotic locale, head to Waikoloa and Hapuna Beach. From the road to Hapuna Beach, pass the turn off to that beach and head to Waialea Beach (aka Beach 69), instead. Here, you will find a stretch of sandy beach cut from lava rock and shaded by a canopy of trees. It’s perfect for snorkeling, swimming and standup paddleboarding in calm water. There really is nothing like having a giant manta ray swim up into your face in the dark. Really. Nothing. And that is just what may happen on a night snorkel or scuba dive from Kona to swim with these giant rays. There can be anywhere from 2 to 32 mantas at a time swimming around you in the water that is lit from above and below. The lights attract the plankton and the plankton attracts the mantas. Dives last for about an hour and leave from the Honokohau Harbor. Where else can you get up close with lava? You can hike to it, take a boat to it and even walk through it in Volcanoes National Park. Many tour operators offer guided lava hikes up to eight miles long as well as boat tours, journeys to black-sand beaches, walking through lava tubes and views of the active eruption. Now is a perfect time to go. Good food makes a good vacation, so splurge on a fancy brunch with a view. One of the best places to go: Mauna Kea Beach Hotel. The sheer variety of the buffet is unbelievable and, when you are spending upward of $60 on a meal, you want to sit somewhere with an incredible view, which is what you will get here. Go early and stay long. The Big Island is a big place. Making sure you can get around is essential to an awesome vacation. Renting a car will cap off a good experience by ensuring that you can get around and go everywhere you want, when you want. Head to the mountains for a cup of coffee at Waimea coffee company then take a leisurely drive through Waipio Valley before heading to Hilo for lava viewing. Take a road trip through Volcanoes National Park. It can take more than two hours to get from one destination to another on the island, so it’s good to have your own ride.